I don’t know about you but my franglais is rather limited to ordering beer and it seems when I say Bonjour I generally get a Bonsoir reply, and vice versa. So, when it comes to shopping in the French supermarche, I can just about work out the contents of a packet, through a few recognisable words and a cartoon picture. For example, a happy pig winking with a chef’s hat on = pork product and a black and white cow with a bell round its neck = dairy product and so on. 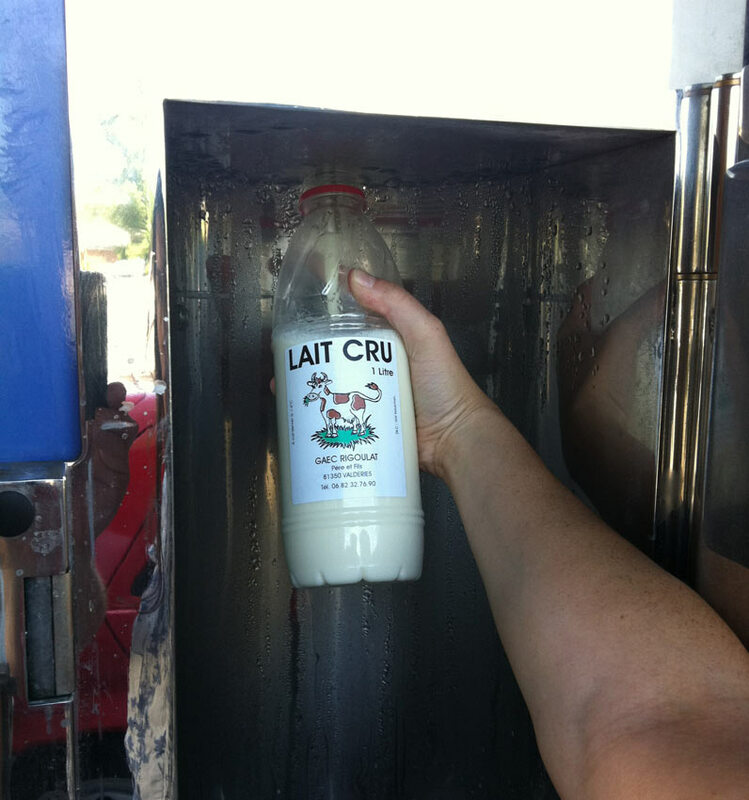 When given the task of finding fresh milk – “just like in England” – for my two boys who demand gallons of it 10 times a day, I’m always perplexed with what exactly is fresh milk in France? There’s a variety which comes in plastic bottles with either green, red or blue tops which is definitely not fresh as it’s not in the chiller cabinet and then there are the cartons of some kind of milk product which has certainly been pasteurised and homogenised but also has a shelf life of about 20 years. Not so fresh. The only thing I can ever find in the chiller cabinet are the minute cartons of which I’m presuming is cream…..due to size, nothing else. Generally, whatever I buy is always the wrong thing, that was until now! Located outside the entrance to the local Intermarche is a vending machine about the size of a photo booth and next to it a slightly smaller one which dispenses empty, plastic, one litre bottles. It was quite clear from the ginormous winking cow, that this was a milk product and to my joy, and a handful of euros, it was indeed the freshest of chilled milk. Getting the bottle was pretty straightforward, 20 cents in the machine et voila. 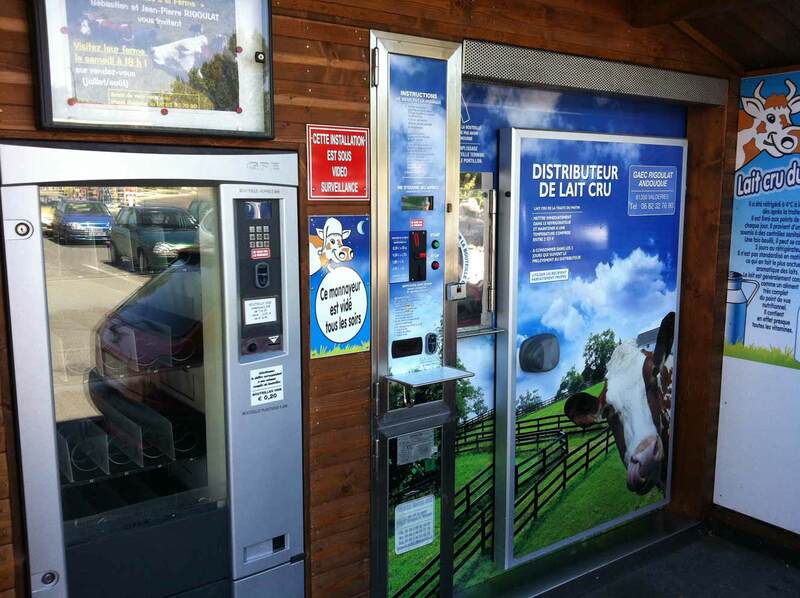 Then, I hovered for some time clutching my 1 euro piece in front of the cow vending machine and finally plucked up the courage to slot in the coin at which point I was greated with the audio of a cow mooing it’s heart out at full volume. Thankfully this is a familiar sound to the passers by so not too many heads turned and stared. Once the mooing had begun, a latched door popped open revealing a tap, spout sort of thing which, when the green button was pressed, dispensed me a litre of the coldest, freshest milk I’ve tasted in years. Of course the first time I came home with the new milky treasure I was quizzed for some time by my constantly sceptical wife asking how I knew it was definitely safe to drink and in fact definitely milk. But once tasted and even after translating the label, she seemed almost convinced. So no it’s not pasteurised but it’s fresher and more delicious than any milk I’ve ever tasted and not a single tummy is complaining……yet.